If you have a lump in your groin or your belly button, you may have a hernia. Of course, there are many other possible causes for a lump in the groin and you need to see a doctor to confirm the diagnosis. However, if you do have a hernia, you may be thinking about whether or not this needs treatment. Here I will provide more information about different kinds of hernias and treatment options. The word “hernia” is from the Latin word “rupture”. A hernia is a protrusion of the lining of the abdominal cavity known as the peritoneum through a weakness in the muscles of the abdominal wall . Most commonly this is encountered in the groin but can happen in other areas. It often contains intestine or other abdominal contents and it usually presents as a lump. This is completely asymptomatic in about one third of patients, although some patients complain of discomfort which is typically described as a ‘dragging sensation’. Very rarely, hernias can be life-threatening if the bowel within the peritoneal sac strangulates and/or becomes obstructed. You will know if this happens because the pain is very severe, and most patients become very unwell. Around 98% of inguinal hernias are found in men because of male anatomy, but women are also commonly affected. Should I have my hernia fixed? If your hernia causes you no symptoms and there is no significant cosmetic problem from the lump, it is quite safe to leave it. Several studies have shown that watchful waiting is safe, but in patients who pursue this strategy, about one quarter will come to surgery within two years and 70% will undergo surgery at 10 years. Importantly, the risk of requiring emergency surgery for a strangulated hernia is very low (3% at two years). So, it really comes down to how much the hernia bothers you and how you feel about the risk of having surgery. This conversation varies from patient to patient as some may have health problems that makes having an operation more difficult. If you are symptomatic, then surgery is recommended. Similarly, if your hernia prevents you from doing your job or engaging in any form of physical activity then you should think about having it repaired. An Epigastric hernia is a protrusion normally seen noted between the xiphoid process (breast bone) and the umbilicus (navel) as a result of weakness or opening of the underlying muscles or tendons. Any person can present with an epigastric hernia but it is more common in men and has a strong association with obesity. An epigastric hernia is usually asymptomatic but can present with pain and/or a notable lump just below the breastbone. The hernia can be aggravated by exercise and eating at times. On rare occasions if small it can also become very painful and irreducible (incarcerated). Usually it will contain fat overlying the bowel (extraperitoneal fat) but can also contain bowel in which case it managed as a surgical emergency (strangulated hernia). If relatively asymptomatic they can be left alone. Small epigastric hernia, because of the risk of incarceration or strangulation are often offered surgical repair. Surgery involves an incision over the lump and closure of the defect with simple sutures. In some cases the repair is reinforced with a mesh. Smaller epigastric hernia can also be repaired under Local Anaesthesia. In larger patients (obese) it may be beneficial to undertake the repair by keyhole technique. This technique will remove the need for a larger up to 10 cm incision with the repair only requiring one 10mm and x2 5mm incisions. Recovery is very quick, with most patients being discharged the same day. Complete recovery is based on individual needs and fitness of the patient. Patients are encouraged to start mobilising gently immediately after surgery and refrain from lifting heavy objects for at least one week. A return to full activities is expected within 2 weeks. Larger patients that are offered the keyhole repair will experience quicker recovery and return to normal activities, as the incisions used will be smaller than an open repair. Your surgeon will advise on any specific complications and risks. For all types of surgery there is always a risk of wound infection and a 1-2% risk of recurrence of the hernia. An incisional hernia usually presents with a ‘bulging’ at or close to the site of the abdominal scar. It is particularly apparent on standing, lifting heavy objects and can disappear on lying down. The hernia presents and progresses over time and can be painful as well as unsightly. Other more serious complications include bowel obstruction presenting with nausea, vomiting and gross swelling of the abdomen. In some cases the bowel’s blood supply can be cut off resulting in a condition called an ‘incarcerated hernia’, this is a recognised surgical emergency. An Inguinal hernia is a protrusion in the lower abdomen/ groin area. It often presents predominantly with a bulge in the groin area but can also present with pain and sometimes a burning sensation. An inguinal hernia usually presents with a lump or pain in the groin area. Exercise, coughing or sneezing can aggravate the hernial lump and some inguinal hernia can also protrude down into the scrotum (men). Small inguinal hernias usually disappear on lying flat. Inguinal hernia are usually reducible by simple pressure but can on rare occasions become very painful and irreducible (incarcerated or strangulated). Usually the hernia will contain a sac, which may have small or large bowel contents. Keyhole ‘laparoscopic’ surgery – This involves a General anaesthetic and predominantly the Trans-abdominal (TAPP) approach for groin hernias. The keyhole technique is not possible in a very small number of patients as there is no space present between the abdominal wall muscles/fascia. This can be seen in patients that have undergone previous surgery with an incision in the lower part of the abdomen due to a major abdominal operation, a caesarean incision and those with an open appendicectomy incision in the right lower part of the abdomen. Mr Dixit will discuss all the options with you and together a decision will be made on which type of hernia repair will suit you best. Recovery is very quick, with most patients being discharged home the same day. Patients that undergo inguinal hernia repair on both sides (bilateral) may require hospital stay overnight especially if they are older (>70). Patients are encouraged to start mobilising immediately after surgery and refrain from lifting heavy objects for at least one month as well as heavy duty activity for a possible further month. A return to full regular activities is expected within 2 weeks for keyhole surgery and up to one month for open groin hernia surgery. A patient information leaflet will be provided which details what possible wound problems can arise after surgery as well as a rehabilitation programme. Your surgeon will advise on any specific complications and risks. For all types of surgery there is always a risk of bleeding in the abdominal wall and/ or groin, very rarely bleeding requires any intervention such as surgery. Older patients and those with large hernias may find more swelling in the area previously occupied by the hernia known as dead space (artificial space created by the hernia protrusion), which can be in the groin as well as the scrotum (in men). The dead space fills with fluid especially in the scrotum, and requires support with tight undergarments but not too tight! This swelling is called a seroma and settles in most patients in 1-3 months with some persisting longer. Occasionally a small bleed into a seroma presents with a haematoma or bruise, this again settles in time but can be unsightly for at least the first 4-6 weeks after surgery especially if in the scrotum, therefore, supportive undergarments are again suggested. Another complication includes wound infection and a 2% risk of recurrence of the hernia. Specifically for inguinal hernia surgery the risk of groin pain and numbness is quoted as a long term risk seen in up to 2-6% of patients. Men of increasing age can in some cases have difficulty in passing urine especially after keyhole hernia repair, this is because the prostate gland can swell. Some patients require a catheter passed into the bladder and may also need some medication, but this is temporary and in most patients the catheter can be removed after 24-48 hours. Very rarely a specialist in urology will be needed for advice. The risks of underlying bowel complications are rare and are mainly associated with the keyhole (laparoscopic) technique and if they occur, are commoner with the TAPP over the TEP method. Other very rare complications that have been described in the literature include injury to major blood vessels and the bladder but these again are predominantly associated with the keyhole (laparoscopic) technique. You will undergo a Magnetic resonance scan (MRI) of the groin. Surgery requires reinforcement of the inguinal canal using a mesh, which can be performed, by open or keyhole surgery. In some cases the main tendon to be released and reconstructed with tension-free mesh placement, to strengthen the repair. Other surgical techniques have also been advocated for sportsmans hernia such as the minimal repair technique, which only uses a stitch to reinforce the inguinal canal. , Both the keyhole and minimal repair techniques have the advantage of a quicker recovery. An umbilical hernia is a protusion directly at the belly-button or navel. A hernia around the belly-button is commonly know as a para-umbilical hernia. Your surgeon will be able to distinguish between the two tyoes of hernia, but there is no difference in the type of repair required. Umbilical herniae are commonly seen in newborn babies and young children. They are usually harmless and generally require no treatment. Childhood umbilical herniae generally disappear as the child gets older. 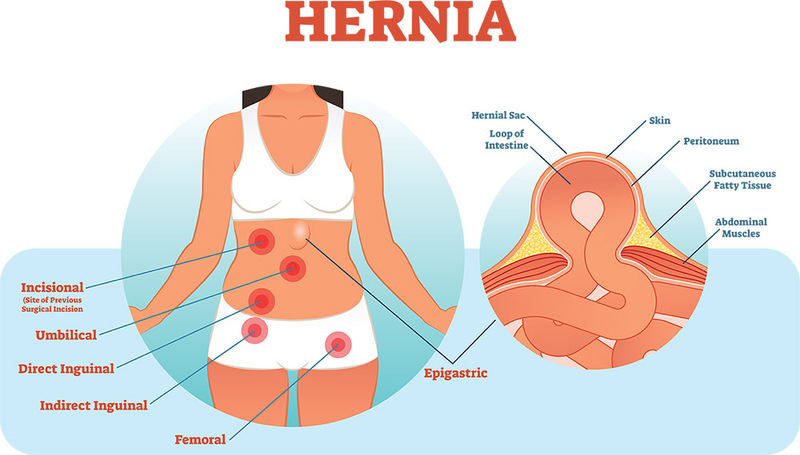 Adults generally present with paraumbilical hernias and are more common in patients who are overweight and in women especially after pregnancy. Umbilical hernia in adults can present with pain and are made worse by heavy lifting, straining or coughing. They are often painless and reducible. In some cases the umbilicus can present with a very painful irreducible lump. If there is a change in the overlying skin with redness or a purple discolouration, there may be ‘unhappy’ bowel or fat in the hernia with surgical repair advised and undertaken as an emergency (incarcerated/ strangulated). This can occur with both umbilical and paraumbilcal herniae as the actual defect is usually quite small. An umbilical/ paraumbilical hernia in an adult if painful and irreducible is often offered repair. They have a tendency to become bigger and more unsightly over time, so in some cases surgery is recommended for such patients. Surgery involves a small incision under or above the umbilicus (belly-button) with the majority of hernia requiring stitches only. In some case if the hernia is large a mesh is inserted to help reduce the risk of recurrence and strengthen the repair. Surgery can be performed under a local or general anaesthesia and does not normally require overnight stay. For larger (obese) patients a ‘keyhole’ laparoscopic approach is sometimes recommended. This avoids a slightly larger incision under the umbilicus as would be expected and allows a quicker recovery with the use of only three small incisions. Your Surgeon will discuss all the options with you and together a decision will be made on which type of hernia repair will suit you best. Recovery is very quick, with most patients being discharged the same day. Patients are encouraged to start mobilising immediately after surgery and refrain from lifting heavy objects for at least two weeks and heavy duty activity for a possible further month. A return to full regular activities is expected within 1 week. Keyhole surgery also has a quick recovery with lifting heavy objects advised against for at least one month. Your surgeon will advise on any specific complications and risks. For all types of surgery there is always a risk of wound infection and a 1-2% risk of recurrence of the hernia. The keyhole repair has a risk of seroma formation, which is mainly managed by conservative measures (wait and watch policy).